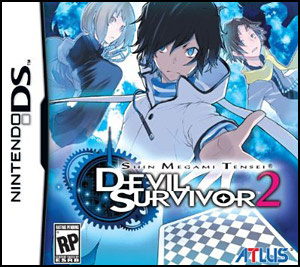 While you might have played Shin Megami Tensei: Devil Survivor Overclocked on 3DS, you'll need to adjust back to 2D to take on the next entry in the series, Shin Megami Tensei: Devil Survivor 2, due out this year on DS. Atlus put out a new trailer for the game with a rather morbid theme, but there's some jollity to it as it reveals a February release for the RPG. Why couldn't Atlus just port this on the 3DS? I still need to get back to Overclocked and finish it. But I'll be keeping my eye on this one! This very well might be the last ds game I buy. For myself anyways. I also still need to finish overclocked. You guys looking forward to this might want to preorder it. Its one of those games that will be hard to find weeks after its launch. A lot of ds atlus games are like that. But will we get an Overclocked version, that is the real question. not a big fan of this game, but it completely baffles me why they made the sequel on the DS instead of the 3DS... seems lazy to me but whatever. So this is basically Final Destination with demons? Sold, day 1, etc. Also, to bonesy91: There are more DS units than 3DS sold right now. Plus, this means anyone with a DS or a 3DS can play. Think about it before commenting that it's 'lazy'. @belmont-You can import this game though, and play it even on your 3DS (since DS games are region-free)! I know I can import but to tell you the truth I don't want! If they want to take money from me they should localize the games. Consider, for example, that I imported Legend of Heroes for PSP that seemed to have zero chances to appear in EU. Then sometime later ghostlight localized it. If I had the import they would take zero money from me. But now that I waited I got their version and with the money I gave them I give them a reason to localize more games. Also money went to local retailers and people from the same country as me, not to some american store that I don't really care about. The only non pal games I have I bought them from local retailers that imported the games themselves after it was clear that the games won't be released here (Radiant Historia and the older Legend of Heroes for example). I can sort of understand how you feel. I guess either way you'll end up getting it. "you'll need to adjust back to 2D"
They're probably not doing a 3DS version just yet because that would necessitate voice acting (if they wanted to keep the precedent set by Overclocked) and this was likely in development before they could reach a decision on that. I really want to pick this game up day one but I'm afraid them releasing an Overclocked version later on. why don't they port to 3DS? um... with like 100 million less users? I'm gonna wait and see if there will be an "Overclocked" version for 3DS. If not, then this will most likely be last game for DS that I buy. Maybe the reason Devil Survivor 2 is on the DS is because they wanted a larger audience. Devil Survivor Overclocked is just a port from the DS version with an added bonus of Voice Acting, 3D and an epilogue. It may also be the same reason Pokemon Black and White were on DS instead of 3DS. I think it's a good thing that Atlus put it on the original DS. That way, it's accesible to everyone who has played the first. Sure, I would have liked to see it as a normal 3DS cartridge with all of the extras of the first one's Overclocked version, but a few of my friends who love the Shin Megami Tensei series don't have 3DS systems yet, so they wouldn't be able to play. Atlus seems to have a habit of making games for older systems, Persona 4 came out on the PS2 in the US over two years after the PS3 came out. Again, it would have been cool to see it on the newer system, but fans who hadn't upgraded yet got to play it. Atlus tends to be really good to their fans, and by not ignoring people with older systems, in my mind, they're showing that they don't want to leave anyone behind. If it won't be released in Europe, I would like to import it. But I've never imported anything. Would I be able to play it on my Nintendo DS? Or is the game region locked?